Yes, folks, act now! Your friends at the Federal Energy Regulatory Commission (FERC) will give you piece of the Pacific Ocean. All you have to do is file an application to reserve your piece of the ocean. Chevron and PG&E have filed applications creating potential rights that constitute a claim over the ocean surface, similar to staking a mining claim. If they "mine" these "claims," the necessary structures would occupy the surface to the exclusion of others, including whales. The California Energy Commission web site has some information on wave energy leading one to believe that this State Commission might be involved. But Bob Aldrich of the California Energy Commission's Media and Public Communications Office stated: "We do not have any “experts” to speak of on wave energy at the Commission. I wrote the page, which was created based on information from a number of places." He also reflected a naive view: "You may also need Coastal Commission approval for such a wave energy device. In fact, the filings are with the Federal Energy Regulatory Commission, the people who allowed California to be ripped off by energy companies a few years ago. Thus the claims are likely to be outside the regulatory scope of State of California agencies such as the Coastal Commission. Legal challenges would inevitably end up in the Bush Supreme Court which has already established its sympathies against state regulation. PG&E is seeking to have two 40-megawatt wave farms up and running off the state's north coasts within a few years, according to documents it has filed with the Federal Energy Regulatory Commission, or FERC. The Mendocino County wave farm will be located off Fort Bragg in open ocean a half mile to 4.5 miles offshore. A 68-square-mile area will be assessed. PG&E essentially will turn the zone into a wave-energy testing ground, spending up to $3 million to try out various technologies from up to four manufacturers. "A number of different device concepts are being pursued by independent device manufacturers, and there is no industry consensus at this time on the optimal energy conversion technology," PG&E execs wrote in an application for a preliminary permit for the project. "The initial ... devices to be used will be selected from device manufacturers who have sufficiently mature technologies available for deployment." On July 2, Chevron California Renewable Energy, Inc. filed a preliminary permit application with the FERC. The Town of Mendocino would be dead center in the claim area, although wave energy plants are not normally visible from shore. It would avoid the Van Damme State Marine Area. The large study area is framed in order to locate a smaller project area. That larger area is a rectangle that runs from three miles offshore to less than a mile from shore, from Point Cabrillo to a spot halfway between the mouth of Little River and Albion. Like PG&E, Chevron plans to evaluate alternative designs and locations of wave energy conversion devices. "These devices would be combined in arrays for demonstration scale or commercial scale power production," Chevron said in a July 5 letter to local government agencies. 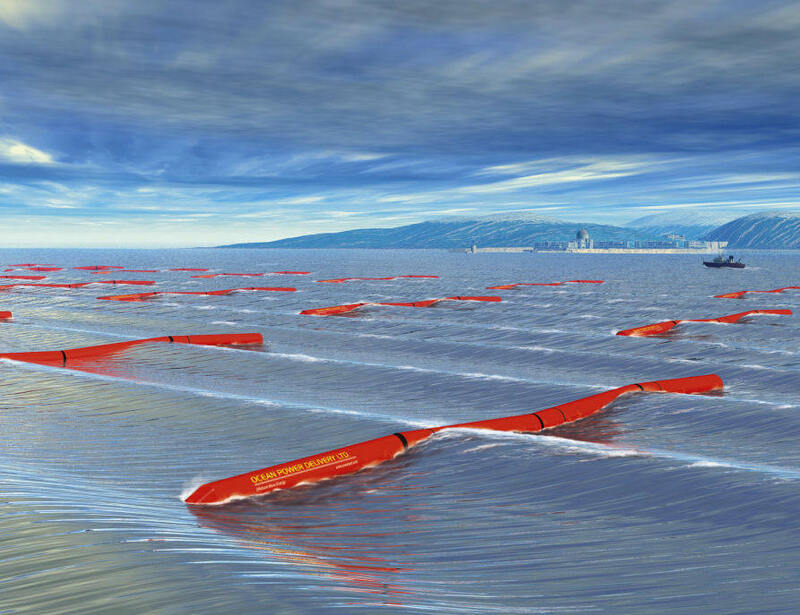 Wave energy technology is moving from the idea stage to the practical at breakneck speed. Chevron's proposal is nearly identical to PG&E's, including a competition among manufacturers and technologies, which could make the Mendocino Coast the world's leading spot for wave energy research, at least as the world stands now. 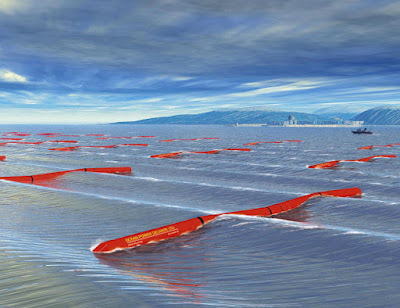 Wave energy plants proposed all over the world generally come with a single technology. 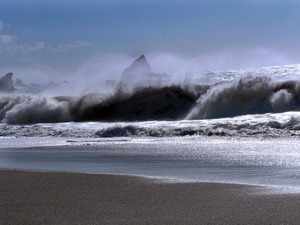 PG&E is in preliminary discussions with Ocean Power Technologies of New Jersey, the U.K's Ocean Power Delivery and Ireland's Finavera Renewables. While wave energy technologies vary, they essentially involve a device that floats on the ocean's surface and that harnesses the power produced by the surf to drive a turbine that generates greenhouse gas-free electricity. PG&E will deploy multiple wave-energy devices in an array moored to the ocean's floor and connected to the shore by a transmission cable. Chevron, however, has picked a company and a technology to start with The Pelamis which resembles a chain of bobbing giant redwood trees or wriggling giant sea serpents. Waves jostle the links between Pelamis sections, pushing hydraulic rams to provide the energy. Chevron estimates the power range from a tiny 2 megawatts to 60 megawatts, about twice as much as needed to power the entire coast. The PG&E plan hopes for 40 megawatts. Chevron is making substantial investments in alternative energy. Although the Chevron company has California in its name, all the mailing addresses are in Houston, Texas. Chevron would connect the power via undersea cable to an unnamed PG&E substation. Chevron promises public meetings and "extensive public process." • Wave energy is clean with no pollution or emission of greenhouse gases. • It is a sustainable and renewable source with high power density and creates working class jobs. • This new technology, with proper maintenance, will be one of the most benign energy-producing technologies around. • He described three of the dozens of different types wave energy devices made today. Street; and a harbor with machine shops and docks that could possibly provide device deployment. • Other fishing communities have formed a port liaison project where engineers and scientists get together with fishermen and crabbers and come up with a solution for the greater good. • National Oceanic & Atmospheric Administration (NOAA) reimburses fishermen for their time spent on the project. • Hal LaFlash, Director Renewable Energy Policy & Planning, PG&E, stated that PG&E is working toward 20% renewable energy by 2010. • The effect of tsunamis is very small as the devices are located about three miles offshore. transponders and lights. Wave machines are also indicated on their charts. • Wave energy devices are modular and installed in small increments. If there are no unforeseen effects, another modular can be installed. • Typically waves that reach the shore are reduced by 10%. • Ocean Beach was not a viable site because it would have been very costly to upgrade power from the west side of San Francisco to the east. • Three California communities – Morro Bay, Eureka, and Fort Bragg will be considered as potential sites September 20, by PG&E, the California Energy Commission, and the Public Energy Commission. • It costs $100 million to $150 million to build a plant which employs about 30 people full time. Independent developers invest in wave energy plants. • Government subsidizes the first plants to get the market going. Production tax credits are offered. • There is no history on how long units last because the technology is so new; however, they are designed to last 20 years. • The mooring is similar to mooring a ship with anchors, clump weights, and cables. • LaFlash added that PG&E has an open solicitation for renewable energy. • The on-shore facility might be at PG&E’s Walnut Street site depending on voltage. • Councilmember Melo suggested that research be done on the Fort Bragg Local Coastal Plan, in particular Environmentally Sensitive Habitat Area restrictions. The easement for the wastewater treatment plant goes out 600’. He believes that outfall was blasted into the bedrock, not buried in sediments. He stated that he supports finding out more about this. • Councilmember Hammerstrom said that he appreciates the depths of answers from Bedard and the fact that he also admits when he does not know the answer. He asked if the site could be relocated from time to time to distribute its effects. Bedard replied that it could be done, but there would be cost impacts. It would have to be a really good reason to move it. Eco-asset management harnesses market forces to preserve, enhance, restore, and create the natural capital life itself depends upon. In this report, eco-asset management is described within the context of the societal objectives defined by the Electricity Technology Roadmap, a collaborative exploration of the future of the global electricity enterprise. Eco-asset management is characterized as a market-based approach with promise for maximizing the productivity of natural resources to promote economic vitality, protect environmental and public health, improve the human condition, and accelerate global progress toward a sustainable future. For companies in the energy, agriculture, mining, timber, real estate, land management, and other resource-based sectors, eco-asset management oilers significant opportunities for increasing revenues, reducing compliance costs, eliminating liabilities, and managing risks. Improving environmental quality, protecting public health, and demonstrating corporate citizenship represent additional—and substantial—benefits. For government agencies and other stakeholders, market-based approaches promise solutions for achieving environmental goals more efficiently and at lower cost, as well as for addressing complex challenges such as climate change, water shortages, and biodiversity loss. There are, basically, two types of wave energy device. The first utilises the essentially up and down movement of the sea’s surface and is usually located well away from a shore-line where the average power of some 50kW per metre of wave front. The other type utilises the action of the waves on the sea-shore. Clearly, which of these devices is used has a considerable effect on the type of environmental impact of wave technology. Off-shore devices have received the most attention in the UK and will therefore be considered first. As wave energy devices extract energy from motion, the water surface behind the device is essentially calm. There is, therefore, a reduction in the sea’s action on the seashore, and hence an effect on its ecology. How effective this change is depends on how far offshore the device is moored and how long it is. The devices themselves could be a navigation hazard, particularly if they broke their anchors. Seals and predatory sea birds may also be attracted to the devices. Although the actual method of energy extraction, the conversion of this energy into electricity, and its subsequent transmission to population centres have not been agreed, it is already clear that the cabling ashore and the siting of transmission facilities, in what would generally be areas of high scenic value, would cause the greatest environmental concern about potential wave energy exploitation. The impact of transmission facilities is, in fact, common to many types of renewable energy sources. What hasn't been discussed is that the Mendocino County proposals would place electrical generation and transmission facilities electromagnetic fields in or near the Pacific Coast whale migration routes. It would likely take a decade after full installation to know the real effects. Are we really ready to do this? If you are and want to get in on the action, you'd better hurry as FERC is likely to fast track these applications to approval before 2009 when a new President takes office.